More than a quarter of a million vacancies are now available, even more than the record number before the crisis. If in 2013 there were ‘only’ 9,000 vacancies, but that number rose to 251,000 last summer, according to the Central Bureau for Statistics. Moreover, these vacancies are becoming increasingly difficult to fulfill, UWV - the Dutch Public Employment Service - recently announced. For companies looking for personnel, it is therefore important to distinguish themselves. Starting with more than a standard vacancy text: holidays, a company car. But also with a clear philosophy or working atmosphere - better known as 'employer branding' in marketing jargon. After all, in a tight labor market, it is the employers who have to put themselves out there. So on a September evening a 150 large audience enters the co-workplaces of Spaces on the Vijzelstraat in Amsterdam. There, together with Homerun, a company that develops application software, an event is organized on the subject: The Art of Work. The participants come together, close to the bar. A man in blue apron opens special beer, a woman goes around with vegan dinner bites. Further on, four lifts regularly drive groups of guests to the eighth floor. There are wooden chairs for a stage with velvet covered sofa ready. As soon as everyone is seated, television screens flash on: smiling staff members. They hold a Friday afternoon drink, have a company outing in Oslo - they are the 'extras' for employees of Vruchtvlees, a Dutch company in web design, says co-founder Rindor Golverdingen. "It is the benefits with which you can distinguish yourself as a company." Together with product developer Rick Pastoor of the digital newsstand Blendle, he is sitting on the velvet sofa. "It's nice, those extras," says Pastoor. But according to him, you have to tell what the company stands for. You have to do more: to spread a philosophy to potential employees - a 'corporate identity'. 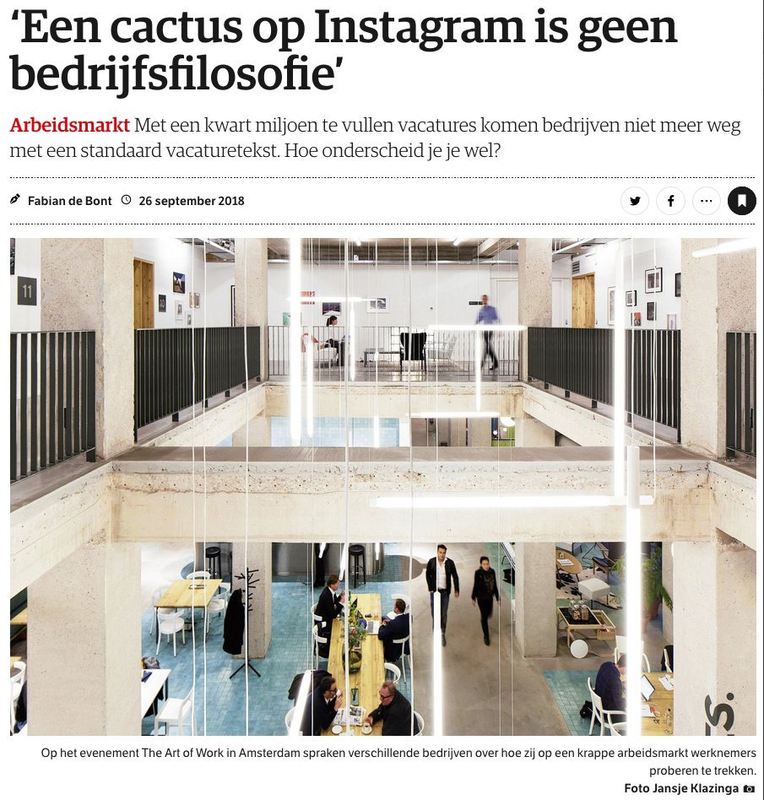 "And I do not mean a random photo of a cactus on Instagram, there must be a line," he says. "As Blendle, for example, we want to save journalism. You do not have to be a journalist, but we do want our employees to believe in that message. "The company actively assists that journalism should be paid for. Anyone who supports that and wants to contribute, is welcome at Blendle, that's the idea. "To define our philosophy, we also speak extensively with the current staff," says Golverdingen. For example, Vruchtvlees recently found out that the staff needed more closed spaces in which you can concentrate well. Pastor nods. "Our HR man went on holiday indefinitely and wrote a manual for the personnel policy. We then made it public. Now everyone knows exactly what we are looking for. "In the manual you can find how a job interview goes, and everything about the dismissal procedure. At Blendle, as can be read, equality is an important part of the culture: everyone must have a say. Twice a year there is an extended moment when everyone gives constructive criticism about the company. "Every employer has its own brand, but not everyone has it", says Thomas Moes, co-founder of Homerun. "Especially young people find their purpose very important besides earning money - the positive impact they can have with their work. Many companies are still not doing enough about this. " Taking care of your employees and propagating that you do that is therefore also very important, according to Moes. "Think of taxi company Uber that did not treat its employees properly. Drivers often worked long and hard, for little money, and protested against it. New drivers now want less to work for the company. "Moes also refers to companies like Google that actually put energy into the personnel policy, just by creating a nice workspace. A number of 'employer branding' specialists will join the stage. Malique Steenbrink, from software company Appical: "Do not only show your strengths, but also the mistakes. A project that yielded little, for example. "Be authentic, is the motto. According to Tatjana Obenaus, specialist at travel site Booking.com, that's right, but we should not forget the details: "Make your jobsite user-friendly for a mobile phone." Yves Pilet, author of the book Boost Your Employer Brand, is slightly more reserved. He says that he is often asked for quick tips and tricks to lure employees, but calls them "nonsense". "If companies fire workers in bushes during crises, they will be left with a bad aftertaste." According to Pilet, as a company you have to be consistent and correct in the personnel policy. It takes years to build a good 'brand', he says. "The only tip is that there are no quick tips." The audience claps, a DJ puts on his first record, the bar staff donates glass of white wine. Not for Arendsz, he has to work again. "It may be a bit of a buzzword, that is employer branding," he says. "But if companies are more aware of their image, is not that right?"